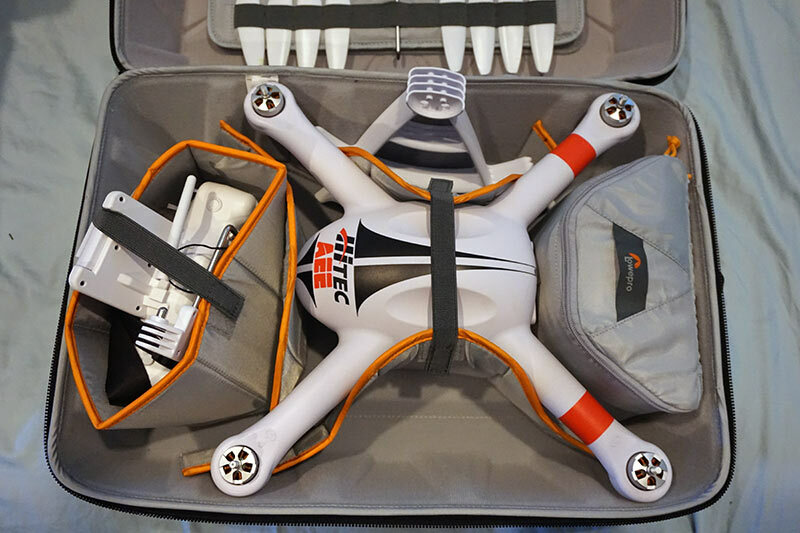 So you have just purchased your new DJI Phantom 3 Professional, Hitec Q-Cop 450, Heli-Max 230Si, or some other expensive quadcopter but you have no easy way to carry both the quadcopter and all of the extra parts, chargers, batteries, and gizmos that are needed to the flight field and back home again, right? Well, look no further than the Drone Guard CS 400 by Lowepro. The Drone Guard CS 400 is a modular backpack style case that will adapt to just about any size drone on the market. It holds up to 400mm form factor drones and was built around the 3DR Solo and DJI Phantom but with its flexible organizational construction it can adapt to any size 400 quadcopter or even smaller sized drones with enough room to hold all of your extras, including cameras. So you might ask, why Lowepro for carrying my drone around? Well, Lowepro has been in the market for nearly 50 years and has been servicing the camera market for as long as I can remember. I’ve been a Lowepro owner ever since I bought my first camera and I still use Lowepro camera bags to this day. Lowepro understands how to create a product for multiple size camera’s but they also know how to keep these highly expensive cameras safe and secure so that’s why I would trust them with my drone and I would imagine the Drone Guard CS 400 would be no exception to that! Enough with my personal experience with Lowepro and how much I love their camera bags, let’s dig more into this Drone Guard CS 400 to see if it can meet our needs for a real contender as a primary drone case! Read on to the next page and we’ll take a closer look at the Lowepro Drone Guard CS 400!